We are your aluminum experts! We'll handle all your screen enclosure needs with professionlism, expertise, and efficiency you expect. You'll benefit from the care we take with communication and attention to detail, while keeping your best interest in mind. We provide free estimates on our wide range of specialties. We guarantee quality work with timely results. We use only the highest-grade aluminum to help increase your homes value. With our stunning designs we are changing the way you view screen enclsoures. 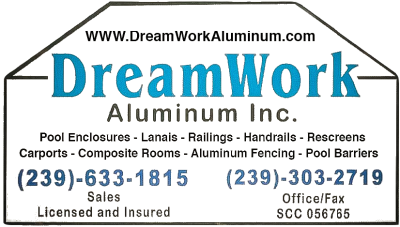 After two decades of working for other aluminum fabricating companies, Shawn Berger founded DreamWork Aluminum in 2004. Shawn's experience in excellent customer service, aluminum fabrication, installation & design helped create Dream​​​​Work Aluminum into what was just a dream into a reality. We are proud to be locally owned and family operated in Lehigh Acres, Florida. ​We have an experienced team of professionals with over 30 years in the industry. Our ultimate goal is to create high-quality screen enclosures & aluminum specialties to enhance your outdoor living space. We are licensed & insured throughout the State of Florida, and have engineers readily available for site plan approvals. 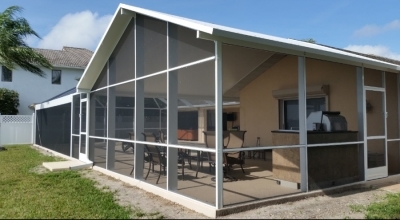 We are a full service aluminum company, give us a call for a free estimate at 239-633-1815! The Picture Panel (Minimal Obstruction) Design. 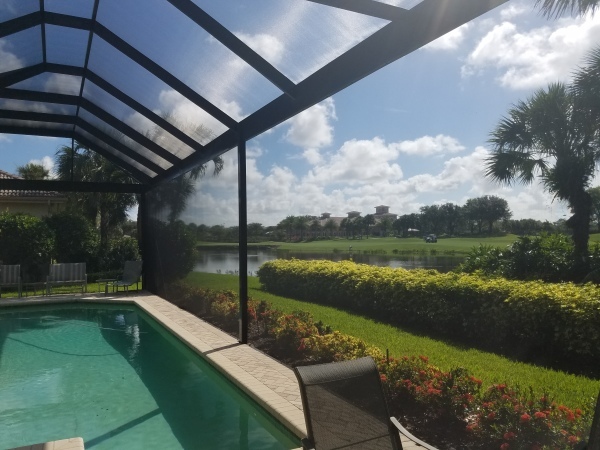 This pool screen enclosure provides you all the benefits of a screen enclosure without obstructing your views of paradise. This is one of our featured designs. The Gable (pitch) Roof Design. 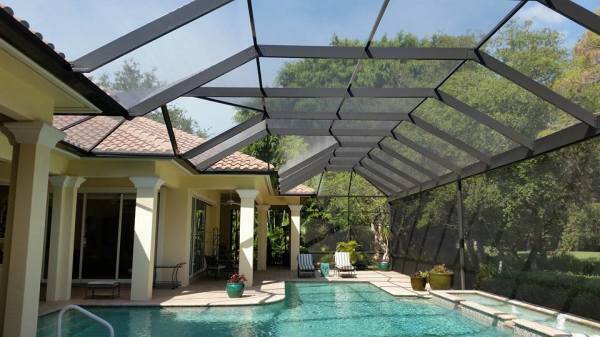 This pool screen enclosure design conforms to your homes exterior angels and roof design. It's the perfect combination to enhance your outdoor living space with style. 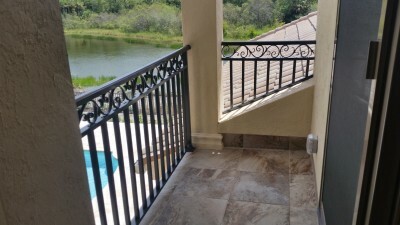 We also offer installation of aluminum railings, handrails, stairs and fencing. We have many designs to choose from. Contact us for more information. A composite roof is a great way to extend your outdoor space. It will provide shade and a solid roof protection from the outside elements. The mansard roof design is the most popular design. 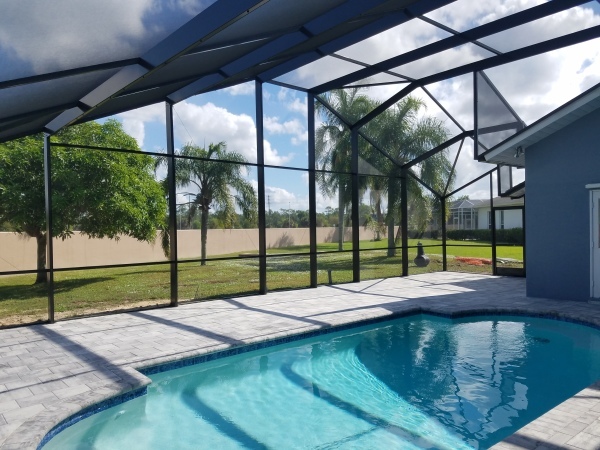 This pool screen enclosure also features our picture window (minimal obstruction) panels, which provides all the benefits of a screen enclosure without obstructing your views. You won't be disappointed with this design feature. 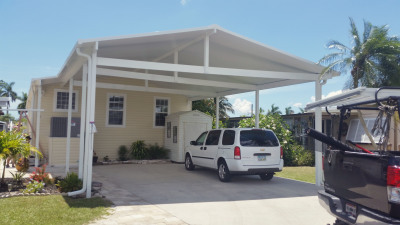 Carports are the perfect addition to your home. If you are looking to extend your outdoor living space or protect your vehicle from the suns harmful uv rays, this will be the best option for you. ​Contact us for a free estimate.